SIP Trunks are popular due to cost reductions, reliability, features and flexibility. SIP Trunks replace fixed Public Switched Telephone Network (PSTN) lines with a flexible, feature-rich system with full PSTN connectivity. 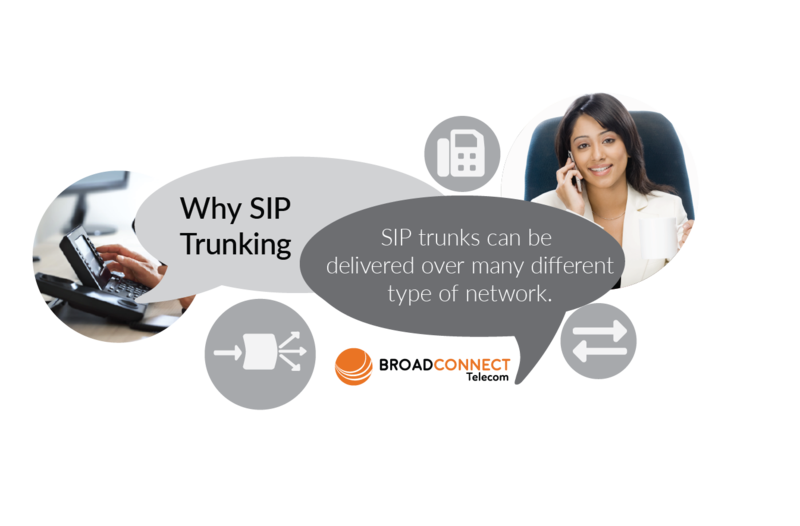 A SIP Trunk is a concurrent call routed over the IP backbone of a carrier using IP technology. Unlike traditional ISDN Trunking, PRIs, or analog circuits where clusters or bundles of physical wires are delivered from the service provider – SIP Trunks can be added or subtracted individually to meet your exact needs. SIP Trunks are the new technology being utilized for corporate phone systems. SIP Trunking is used in conjunction with an IP-PBX (Private Branch Exchange) and is fast becoming the standard technology that businesses use to make and receive telephone calls at a lower cost and with more features. The popularity of SIP Trunks is due to cost savings, increased reliability, added features and flexibility. Customized business SIP Trunking solutions offer you the flexibility and scalability needed to meet current and future communication needs, as long as you select the right company from available SIP Providers. Although SIP Trunking is as a common standard used industry wide, the implementation differs depending on the IP-PBX or PBX manufacturer. BroadConnect has under gone extensive interoperability and certification processes, and we know the ins and outs of a deployment no matter which IP-PBX or PBX equipment is used. BroadConnect, an IP phone company, maintains ongoing communications between our engineering staff and the manufacturers’ as well as a continuous testing process to keep up with the latest product updates and software revisions. You’ll have a flawless installation process and ongoing support when you combine BroadConnect SIP Trunks with one of the following vendors and this includes a Call Center PBX. BroadConnect Canada can provide you with the final mile of your Data Circuit (ADSL, T1 or Fibre). As a result, the Voice Packets do not touch the Public Internet Space. This ensures the Quality of the Voice is the same as traditional copper lines. This is why BroadConnect VoPI (Voice over Private Internet) outperforms VoIP Line on the Public Internet Network. Here is a list of our main city SIP Service locations. A call travels the majority of its path over the BroadConnect network instead of on the PSTN and then drops back down to the destination/facility at the last mile. When calls are not in use, the remaining bandwidth is available for data. This deployment method is most strongly recommended because it ensures that your voice traffic will not be affected by internet usage. Voice traffic will travel over our Private Network connection. 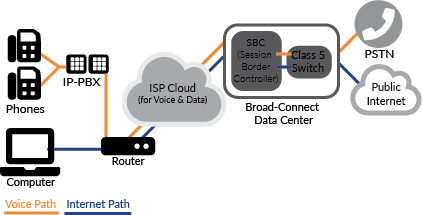 The Voice optimized Data Circuit for SIP must be from one of the top VoIP service providers, like BroadConnect. For just Internet Connectivity, there are many options. In this setup voice and data are transmitted through a single BroadConnect provided data circuit. By choosing BroadConnect as your primary ISP, this will ensure your SIP/Voice traffic stays on our private network. Because our Data Internet circuits are optimized for Voice traffic, your call quality is less likely to suffer from heavy internet traffic. Using your existing third-party Data Circuit for Voice and Internet is the least recommended method. 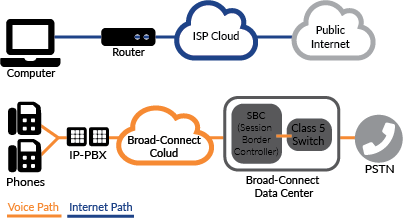 In this setup, the customer uses their existing data connection to connect to our SIP service. BroadConnect has limited control over quality. This setup works best with less than 4 SIP Channels or Wi-Fi with T1 or Fiber Internet Service. If you have already invested in a Non-IP, Legacy or Digital PBX system then you can still use our productivity boosting, cost-effective, SIP Trunk service. In this scenario, SIP Trunking is delivered to your Legacy PBX Systems by using an ATA (Analog Telephone Adapter) or IAD (Integrated Access Device) that allows SIP Trunks to seamlessly connect with your system.BroadConnect performs extensive interoperability testing with each PBX manufacturer before we make our service available in conjunction with their equipment. BroadConnect’s Network sends the Caller Name to the called number. By default, the Caller Name is the name of your organization. BroadConnect sends the Caller ID and Number to the called number as provided by the IP-PBX. BroadConnect’s Network identifies each Caller Name from the number provided by the IP-PBX.